Last week, we announced our 2010 Back to School "Musicians For Mentoring" benefit concert, a show that will feature local cause-minded artists and bands this coming August. This is a co-production between Mapping for Justice and business leader Shore Capital Management LLC. But that's not all we're doing in 2010 to partner with business leadership, to find new ways to bring the maps to the people who can use them, and to provide new ways for you to join us in the war against poverty though mentoring programs. In addition to the music benefit, we are also taking up an offer to contribute to an art gallery benefit this year. The gallery will be curated by a prominent member of a leading global risk management and insurance company, currently headquartered in the Loop, and all proceeds will be donated to Tutor/Mentor Connection. 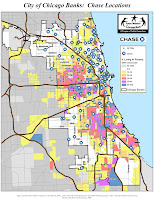 Mapping For Justice will be contributing maps and other resources to the event, which will explore the past, present, and future of one of Chicago's high-poverty and high-crime neighborhoods. The gallery will provide a look into the lives of people who live in the neighborhood, and then examine how Mapping For Justice maps can be utilized by local leaders to build new tutor/mentor programs for students who make choices every day between the streets, and reinvestment in themselves, their community, and our economy. The Art Gallery and Music Benefit provide two ways you (or someone you know) can join our growing team of sponsors, or provide press, radio, PR, or other promotional support... for the events... but also in support of mentoring as part of the long-term solution to poverty and its associated ills. Many of you might think this is a "nice thing" - helping those in poverty. But you might also be asking yourself, in these trying economic times, "Isn't this something that they should be handling? Shouldn't their parents be the ones doing something about poverty? How is this really my concern?" Please take a look at this report, which makes a case for "the cost of poverty" as a huge additional (and often under-discussed) economic burden that you and all tax payers are carrying. If we can work together to put a dent in poverty, we stand to be rewarded with safer communities and a stronger economy for everybody. Leaders of the business community are understanding this and stepping up for mentoring. Why don't you join us? Meantime, have a little fun, from the comfort of the seat you're sitting in right now! You don't have to even move! Click here to learn about Cabrini Connections "Cabrini Madness 2010" Tournament! Join community leaders Shore Capital Management LLC, Loyola University, LALA Images, Webster's Winebar, and Mapping For Justice in support of "Team TEMS," the Cabrini Connections Tech Club entry in the tourney by making a small tax-deductible donation - anything you can offer - to these Cabrini Green 7th-9th grade students, who meet weekly with local IT and design professionals, to learn marketable tech skills. Learn more about the tech club here! 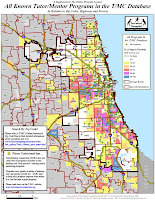 In my last blog, I presented a case for poverty as your problem, and discussed ways Mapping For Justice and Tutor/Mentor Connections are fighting to alleviate the costs of poverty to you, me, and our fellow taxpayers. I promised to begin introducing you this week to a few new exciting events we are proud to be co-producing this year - opportunities for you to get involved with mentoring as sponsor, participant, or simply by passing the word along through your network. The first event I'm announcing this week is something that really excites me! Together, Mark Shore, CIO Shore Capital Management LLC, and Mapping For Justice will be co-producing a Back to School "Musicians For Mentoring" benefit concert in August. A business leader who understands the sense in "giving back to the community," and a musician himself, Mr. Shore recently relocated from New York City, where he had experience organizing similar fundraisers. And me? Well, I'm an independent working musician in Chicago and my new CD will be hot off the presses right about the same time! Together this summer! Mentoring, maps, music, business leadership, and YOU! Meantime, please contact me if you or anyone in your network might be interested in joining our growing team of press, radio, PR, and other back-end support for this fun event... in promotion of mentoring, students, and our community. Oh and don't forget to join Shore Capital Management LLC and Mapping For Justice in support of Team TEMS, the Cabrini Connections Tech Club entry in the Cabrini Connections "Cabrini Madness 2010" Tournament! Head here to learn more about Cabrini Connections Tech Club (or "Team TEMS" - Technology Expertise for Mentoring Students - as they've dubbed themselves)... These Cabrini Green 7th-9th grade students have been meeting weekly with local IT and design professionals, and together they are in the process of developing a video game (to be released later this year!) In the spirit of advocacy, the video game will provide an interactive look into tutoring/mentoring. It casts students from Team TEMS as the heroes, and examines the challenges they face in building awareness and raising the funding needed to keep Tech Club operational. Together with you, Team TEMS will continue to fight for students' futures, for your community… and for the glory of the “Cabrini Madness Tournament 2010” championship! Earlier this week, I argued that poverty is your problem. I cited “cost of poverty” reports that estimate the costs to the U.S. associated with childhood poverty at $500B per year, or the equivalent of nearly 4 percent of GDP. Tutor/Mentor Programs attack the roots of the problem with an eye on the future, working to empower inner-city students at young ages with the tools, guidance and edge they will need to advocate for themselves, make good decisions, and ultimately make positive contributions to the economy. Tutor Mentor Connection (T/MC) and Mapping For Justice (MFJ) are potential weapons in this battle to curb poverty-related costs. See, The T/MC and MFJ provide strategies and innovative map tools – a toolkit that helps community leaders analyze need, build alliances, and take action to support new tutor/mentor programs. Together, we are helping to connect at-risk youth in their formative years with guides who know what it takes to get better grades, and navigate their way to careers. With more social investment from Chicago's business, political, faith, and community leaders, we can do even more in 2010. Many argue, "This is their parents' job, not mine!" ignoring the reality: Many of these kids don't have parents with this guidance. Instead, many of our current and future neighbors get their direction and "career" training from the streets. And it's costing you and me to continue gambling that this will suddenly changes on its own overnight. In 2010, MFJ will co-produce a few events, and provide new stories/maps that make more sense of all this – stories you aren’t likely to see in the media (until we start demanding it). It is my hope to continue blending my map/tech/education skills with T/MC strategy to directly impact the way we look at poverty, the way media addresses this crisis we all face, and the way leadership looks at policy. It is my hope to increase my capacity to equip more leaders with these weapons... these tools... and take T/MC and MFJ to a new level of effectiveness in doing what we can to address the costs of poverty. We are looking for new social investment: appropriate grant money, PR and marketing assistance, and sponsorship for our 2010 events, in order to maximize impact, and get our quality tools into the hands of more community leaders and policymakers. Contact me if you have grant, marketing, or sponsorship leads! Check back next week for a preview of the 2010 events we're co-sponsoring, and how you can participate! 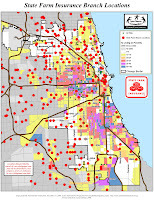 Poverty and high poverty neighborhoods affect you, your economy, and your pocketbook. Those statistics consider lost earning/spending potential, crime and prison related costs, the cost of poor health on our health care system, and other social costs to you… burdens that policy makers continue to address with a money pit of policy that often ignores these poverty-related statistics. The research on the cost of poverty, cited above, was conducted by Georgetown University, the Urban Institute, the University of Chicago, Northwestern University, and the National Bureau of Economic Research. Their findings recommend long-term “social investments” to “generate returns to society over time in the form of higher real gross domestic product (GDP),” and they propose that "the investment of some significant resources in poverty reduction might be more socially cost-effective over time than we previously thought." Significant investments over time... this might require a paradigm switch for a nation that tends to think in terms of immediate gratification, quick fixes, and short-term "return on investment." We are working to change the way Americans look at poverty and its costs to all American everywhere. * Since the 1990's, Tutor/Mentor Connection (T/MC) has been stockpiling strategy documents, compiled from the shared knowledge of mentoring leadership across the nation. This ongoing effort works to ensure mentor-to-career programs fit as easily as possible into any comprehensive anti-poverty initiative. * Two years ago, Mapping For Justice (MFJ) was created to build an infrastructure that provides community leaders and policy-makers with maps, to help visualize mentor program availability/need... and then target where investment in mentorship is needed to make a bigger long-term impact on the costs of poverty. 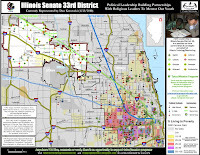 * The MFJ is finally attracting the attention of business, education, and political leadership in Chicago... leaders who recognize the importance of long-term social investment in our children over many years... and who recognize the long-term impact T/MC and MFJ can have in providing more student with the tools and guidance they need to side-step the lure of the streets en route to productive futures that won't continue to burden YOU. * How you can get involved in the exciting map- and mentor-related events these partnerships are co-producing in 2010... events that will raise new awareness and draw new investment to poverty-fighting through Mentorship and Mapping For Justice.